While growing up in the northwestern Malaysian state of Kedah, the first chapter of Yunalis Zarai’s unlikely path to pop stardom began, she says, with her parents’ Beatles albums. She started writing her own songs as a teenager, and she taught herself guitar. Then she went to law school. In between studies, she began performing under the name Yuna. In 2006 she auditioned for the televised singing competition “One in a Million” and made it to the final 40. By 2008 her songs on a MySpace page had racked up more than a million plays. In 2010, degree in hand, she set it aside for music. Blending and blurring pop, R&B, jazz and folk, all with an international touch that connects her to global audiences, she hasn’t looked back. 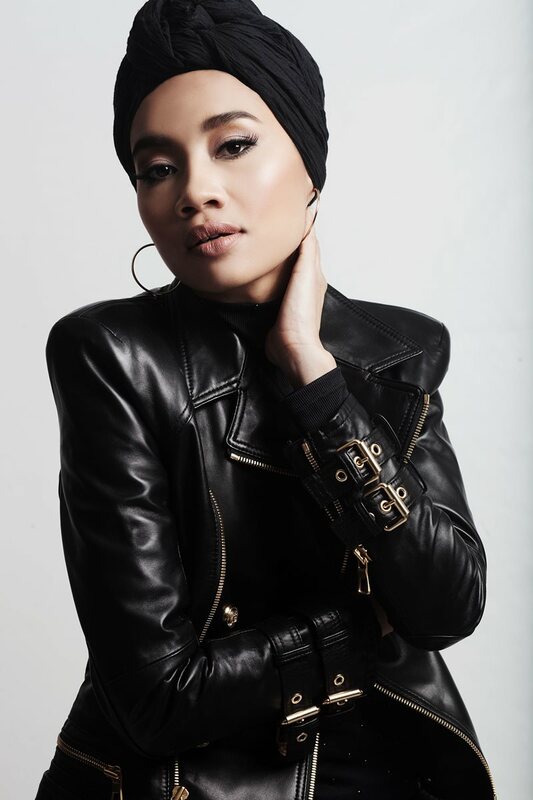 Blending R&B, pop, jazz and folk, Yuna performed in Houston during her US tour last fall. She broke into the US music scene in 2012 with a single, “Live Your Life,” produced by singer and recording producer Pharrell Williams (of “Happy” fame) who went on to oversee her first album, Yuna. Last year, she released her third album, Chapters, and recorded a video duet of its lead single, “Crush,” with R&B star Usher that hit No. 1 in Malaysia and No. 3 on the US R&B chart. For the lead track on Chapters, the wistfully reflective, smoothly joyous “Places to Go,” she teamed with legendary DJ Premier of Gang Starr. These days she lives in a place nearly 14,000 kilometers from home: Los Angeles. But through music and fashion, she is finding ways to shrink the world. Last fall she took a few minutes during her tour to talk about her unusual path. Chapters is a title that speaks to the ways we compartmentalize time and our lives. What’s up with that for you? Yuna: I wrote about 50 songs for the album. And I started to edit them down. I wanted songs that would go together to tell a complete story about what made me who I am today. So one song is about me and my mom, who discovered I could sing. We’d never spoken about that. But now I’m older—I’m almost 30—and I think about it. Many of the songs were like that. I see life different now, and I see love different now. It seemed like a good name for the project. Home seems like a difficult concept for you. I guess I see Los Angeles as home because it’s my little hiding area, my little haven. At the same time, my family and friends live in Kuala Lumpur. So it’s not a conﬂict exactly, but it’s a point I’m still figuring out in my life. I’ve been in America for a while, but sometimes it still doesn’t quite feel like I’m home. I feel like an outsider sometimes, which is not healthy, but I have an apartment here, and I’m making it feel like home. Have you noticed changes in your vocals since you’ve started? To my ear there’s been a lot of growth, a confidence in the singing. I think that just comes from character-building over the years. When I fall in love with a TV show, it’s because I fall in love with the characters. I’ve done this for 10 years now, and I think back to the first time I started singing. I’m the same girl, but not the same girl. The core of it is still me. There have been a couple of cycles of tours performing in front of audiences, and that has made me a better singer—and a better writer, too. So I think I’m doing things I couldn’t even do five years ago. Five years ago I never would’ve written anything worthy of working with DJ Premier or Pharrell. These things are part of growing. They’ve surprised me as much as anybody. Getting to do a song with Usher—I’m really grateful. It’s also involved a little luck, so I try to remain humble and respectful. That got me where I am. I didn’t play by the book exactly, but I think I stayed myself. How was it working with DJ Premier on “Places to Go”? It was fun. In the beginning we wanted to make music, but we started by staying in the studio and talking about life until we got to know each other well. I was in Los Angeles; he was in New York. On that song I was singing about struggling with my career, being away from home, missing my family. Personal stuff. It was about me picking up the pieces in my life. He helped me put that all together. Is there anyone you would love to work with that might seem unexpected or in a different space? I would love to work with Thom Yorke (of Radiohead)! Or Bon Iver. You have a line, “My dreams seem so far away,” and another, “We were meant for something bigger than this.” Taken together, they suggest a prevalent feeling of hope. Do you ﬁnd that a difﬁcult feeling to sustain? It really can be a challenge in that you’re a real person living a real life. A normal person. I have my own problems with family or financially. Once in a while, life teaches you things that are difficult, but I’ve always tried to remain hopeful and focus on the important things. I think that’s why my family is so important. I’d do anything for my parents. While writing “Live Your Life,” it came to me when I was in the studio with Pharrell. He said he could feel people in the club dancing and meeting to that song, and I said, “But that’s not me.” I don’t go to clubs. That’s not part of my life. But I guess it has a hopeful tone that can mean different things to different people. I just try to write about life and share it with the world, and if hope comes out of that, I don’t think it’s a fantasy. I’m not the person who will sing the song about “let’s live tonight, there’s only tonight.” I’m more interested in something you can hold onto forever, even when you’re going through a rough time. I imagine that means a lot of listeners feel a particularly personal connection. It’s difﬁcult to say. I perform it every night, and sometimes the meaning goes away a little for me. But I always come back to the first time, back when I wrote it, because I know there are a few people who depend on it. I’ve had fans say the song helped them. I met a girl with cancer two weeks ago. I didn’t know what to say to her, but she said she goes to treatment and lives life. She remains positive. So maybe that song is a small part of her staying positive. 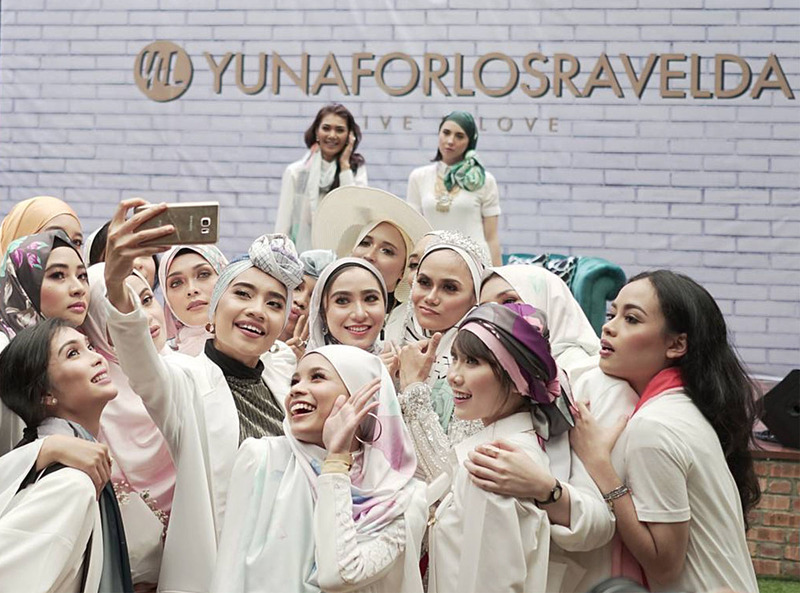 In November she kicked off her scarf line YunaForLosraVelda at a fashion show in Kuala Lumpur, Malaysia, with this photo posted to Instagram. 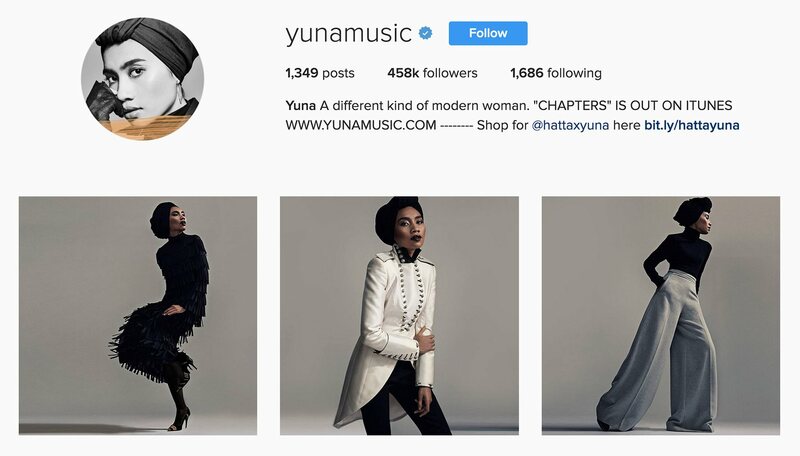 Now in addition to music you have the HATTA Yuna clothing line as well as the 14NVOV collection; you make jewelry; you are the face of Uniqulo’s Hana Tajima hijab capsule collection. How did fashion become such a part of your life, too? I guess I’ve always been into fashion since I was very little. I would observe the kind of clothes that my mom would shop for. She really raised me to dress up. You know, we had just enough, never bought expensive clothes, but she would always make sure I looked stylish. She’s the kind of mom who would never let me out wearing ﬂip ﬂops and creased shirts! So I guess I always liked having style. Is the feeling or gratification you get working on a clothing line similar to the feeling you get while performing music? It’s kind of similar. I like to collaborate with other designers on a clothing line. It’s the same with music. With clothes, I just want to share a part of my style. I understand that not a lot of people will embrace your style, it's the same with music. If you make music for the masses, then you’re able to sell it very well. I try to find a nice balance between what I like and what everybody else likes. Any regrets not sticking with law? Going to law school definitely taught me how to be focused on my career and knowing more than just singing a song and smiling for photos. Education is important. It enriches someone’s character. @yunamusic features both her music and fashion: She posted this series displaying her fashion-forward looks for Ladygunn magazine. On Instagram recently you said you were having a “Smashing Pumpkins kinda Monday.” What would a “Yuna kinda day” be like? A lazy afternoon. Slightly hot and sunny. Slow spinning ceiling fan, flowers by the window, and “Desafinado” playing on my record player. 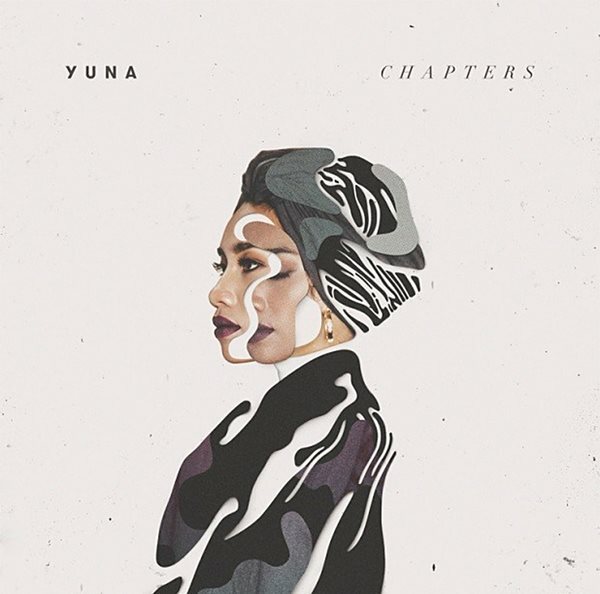 If life is like the title of your album Chapters, what do you hope people come away with after taking in the book that is Yuna? A sense of self. I want them to discover that love is a fragile thing, and it must begin within yourself. (@andrewdansby) is an entertainment writer for the Houston Chronicle whose work has also appeared in Rolling Stone, NME, Men’s Journal and more.